Excalibur B-Shelving Is Used For Providing Attractive And Reliable Shelving Solutions. Excalibur B-Shelving is made for long lasting durability and dependability. 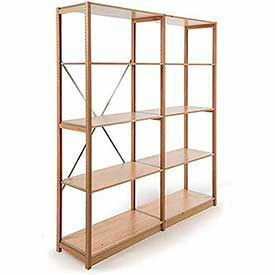 Units are comprised of solid Douglas Fir wood uprights and 3/4 inch Pine shelves, edge-glued with clear lacquer finish. Easy to assemble and fully adjustable in 1 inch increments. 5, 6 or 7 level Fir Upright and 3/4 Inch Pine Shelving units are available in 24, 36 and 48 inch widths, 12, 15, 18 and 24 inch depths and 72, 84 and 96 inch heights with 150, 200, 250, 300, 350, 400 and 450 lb. shelf load capacities. Single 3/4 inch Clear Finished Pine Shelves With Beige Coated Steel Ends available in various matching dimensional sizes. 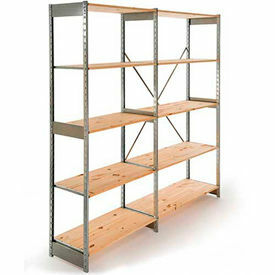 Made in U.S.A.
Excalibur D-Shelving Is Used For Providing Versatile, Strong And Reliable Stockroom Shelving Solutions. Excalibur D-Shelving is made of fully assembled, corrosion-resistant galvanized steel uprights and solid 3/4 inch adjustable New Hampshire white pine shelves for long lasting durability and dependability. Easy to assemble and reconfigure. Used or use in retail environments as well as dry food storage areas. Simple design offers no loose rails, posts or beams to assemble. One piece pine shelves and preassembled galvanized steel uprights integrate to form a strong stockroom shelving unit. 5, 6 or 7 level Galvanized Steel Upright And Unfinished Pine Shelving units are available in 24, 36 and 48 inch widths, 12, 15, 18 and 24 inch depths and 72, 84 and 96 inch heights with 150, 200, 250, 300, 350, 400 and 450 lb. shelf load capacities. Single 3/4 inch Unfinished Pine Shelves With Galvanized Steel Ends available in matching dimensional sizes. Made in U.S.A.